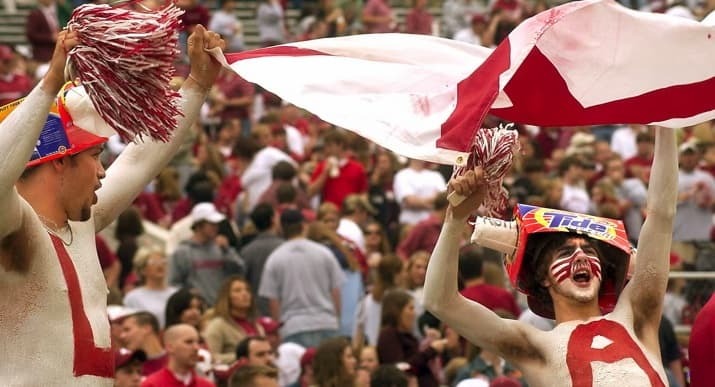 TUSCALOOSA, Ala. — Every good Southerner knows there are only two religions in Alabama – football and football. This week, a new maxim emerged: When it comes to the state judicial system, there’s a lot of crimson hiding beneath those billowing black robes. Circuit Judge Dan King announced Wednesday he would grant a delay in the civil suit Traywick v. Energen Corporation, which was scheduled for trial Jan. 4 in Bessemer, Ala., a suburb of Birmingham. Energen’s defense attorneys want to attend the showdown between the University of Alabama football team and the University of Texas at Austin, scheduled for Jan. 7 at the Rose Bowl. If Alabama wins, it will be the first time in 17 years that they’ve claimed the Bowl Championship Series national title, considered by many to be the apogee of college football achievement. “Such an event only comes infrequently during a person’s lifetime and is an achievement of such a magnitude that all involved in this litigation should want everyone to fully participate in this achievement,” writes Jon Terry, attorney for Energen, in his nine-point motion for a delay. Because so many lawyers, jurors, and witnesses are planning to travel to Pasadena, Calif., for the Alabama football game, it would be a hardship, he says. February would be better. Much better. After all, who could have anticipated the Alabama Crimson Tide’s 32-13 romp over top-ranked University of Florida, the 2008 national champion, on Dec. 5? The shock even got to unflappable Gator quarterback and demigod Tim Tebow, who was spotted on the sidelines in tears as Alabama cavorted in the end zone. Attorneys for plaintiff Mark Traywick aren’t as supportive. In the suit, Mr. Traywick seeks damages for the March 2004 death of his mother, Irene Traywick, whose car exploded when she struck a gas meter and power box. Energen’s Mr. Terry has a different take. Point six of his motion to delay suggests that Traywick and counsel are fans of Alabama’s nemesis, Auburn University. “The reply has been that they are for the other great team in this State [sic] who did not make the playoffs,” Terry writes. Judge King told The Birmingham News he granted the motion because, as an Auburn alumnus, he didn’t want people to accuse him of pigskin partisanship. Legal delays are common, but this may be the first time a football game has pre-empted a trial, says Scott Vowell, presiding judge of the 10th Judicial Circuit for Jefferson County in Alabama. Of course, he’s heard a myriad of other excuses over the years. Funerals. Illnesses. The dog ate my briefcase. The best was the time an attorney asked for a delay so he could join an evangelical rock band and a troupe of Russian ballerinas on a tour of England. Judges like honesty. Some also like football. But there’s also something else at play here – regional pride. For all the progress that remains to be made in the South, football is an area where Alabama excels. It’s nice to be first in something, Vowell says. It’s even better when it’s served with a side of championship ring bling. In this case the judge’s verdict is final: Sports, at least when it comes to Alabama football, take precedence. Alabama, Christian Science Monitor, football, sports, Tuscaloosa. Bookmark.